Night of November 15, we will be able to witness more singing skills that will stop us. This is the 5th episode of The Voice of the Philippines Season 2. The Blind Audition continues. For the record, Team APL already has 3 artists, Team Lea has 1, Team Bamboo has 3, and Team Sarah 2. The Blind Auditions for The Voice of the Philippines continues as the four coaches, Sarah Geronimo, Bamboo, Lea Salonga and Apl De Ap battle against each other to get their hands to their chosen artist. The November 15, 2014 episode yielded them 6 artists who can now advance to the Battle Round and then they can choose which one can survive. Battle Round can also give a chance for a coach to steal an artist. Carol Leus is 24 from Batangas. Carol sung ‘Tattooed Heart’ by Arian Grande which made Sarah turn for her in the very last note. Carol jumped for joy as she advences to the next round with her idol as her coach. Samatha Felizco sung her heart with the song ‘Hurt’, which made Apl De Ap and Lea turned at the same time. Bamboo evidently realized that he waited too long and promised to steal her in the next round. she had chosen Apl because she likes Fergie in his group Black Eyed Peas. She explained that his internationally known singing group had influence her childhood. Shairah Shervancia is a young artist from Palawan. Singing ‘Sabihin Mo Na’ she tries to make the coaches turn to her. Bamboo told her that she should unlearn some singing habits and she must not try to change her natural voice which is already great. Sha had chosen bamboo over Sarah because she aspires to be a band member. Nino Alejandro came from a known musically inclined family. Haji Alejandro’s nephew is the only four chair turner of the night for his performance ‘Highway to Hell’. Lea immediately hit the big red button. She belted ‘Oh my God’, and then the other coaches turned to finally see the artist making a wonderful performance. Nino was happy to be back in the industry and then picked Lea to be his coach, knowing that she can guide him back to the music industry. Jon Philippe Go is a product development chemist who tried his luck in the stage of the Voice. He picked ‘Hangang’ to reach out to the coaches. Lea was moved by the song and decided to turn for him the Bamboo also turned without warning. Lea seemed to have been ticked off to which Bamboo tried to set her in better mood by telling her to relax. In the end Lea was picked by the artist. Ramonne Rodriguez wanted to inspire people with her talent, making her more determined to be The Voice of the Philippines. Wala Ng Ibang Pag-ibig is her chosen song to capture the attention of the four coaches. Bamboo then voiced out that he liked what saw as he turned. Happy being in Bamboo’s camp, the20 year old artist could not hide her excitement that she finally has a chance to reach her dream. The six new artists will be working with their coaches for the next round. They will be battling against their camp members to which their coach had to choose which artist they will have to let go. The artist that would be let go can be stolen by another coach who can give them another chance to continue for the run of The Voice of the Philippines season 2. 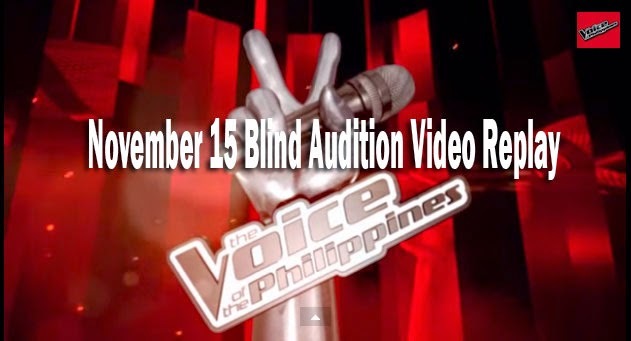 Bookmark and reload this page from time to time to see live update of The Voice of the Philippines Season 2 November 15, 2014 Blind Audition. Follow us on Facebook and Twitter.